This Nativity set of wire and beads is made by Patmore. The beads used in these figures are high-quality glass beads rather than plastic beads. 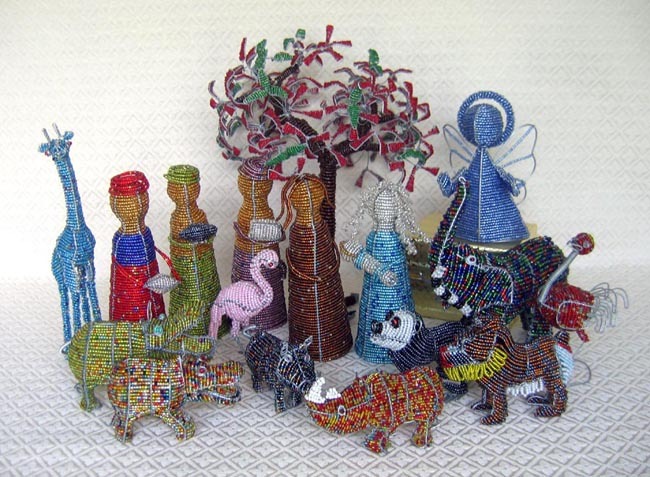 The set includes Joseph with dreadlock hair, Mary holding baby Jesus, three wise men with gifts, an angel, a mopane tree, and ten African animals (pictured from left): a giraffe, a mamma and baby hippo, a flamingo, a warthog, a baby rhino, a lemur, a mandrill baboon, an elephant, and an ostrich. The wise men figures measure 7.5 inches tall.